The 128.48-carat Star of the South is one of the world's most famous diamonds. Discovered in 1853, it became the first Brazilian diamond to receive international acclaim. The stone was graded as VS-2 in clarity and Fancy Light Pinkish-Brown in color. It was also determined to be a type IIa diamond. It was the custom in the Bagagem Diamond Mines in Brazil for a slave worker who found a stone of mentionable size to be rewarded with his freedom which offered him the opportunity to work for a salary. In addition he might be given clothes, tools and in some cases a procession in his honor and during the ceremony might be crowned with flowers. All depending on the value of the stone found. This was done to encourage honesty amoung the workers. There were also several punishments established for those who were caught smuggling diamonds out. In 1853 a slave woman while working in the mine discovered a 261.88-carat diamond. For this she was reward not only her freedom but in addition a life income. Yet apparently not aware of its true value, her master was induced to sell it for the modest sum of £3000, after which the purchaser disposed of it in Rio de Janeiro for $30,000. The rough stone passed through many hands before it was sold to Costers of Amsterdam for $35,000 and cut to a 128.48-carat stone losing over half its original weight. The cutting cost was $2500. It was cut into a cushion-shaped stone with a faint pinkish-brown hue. It was purchased by Halphen & Associates of Paris and was given the name the Star of the South. They displayed the stone at the London Exhibition in 1862, and in Paris in 1867 making it quite famous. At this time, the syndicate was offered £110,000 by an unknown Indian rajah, but the offer was declined. 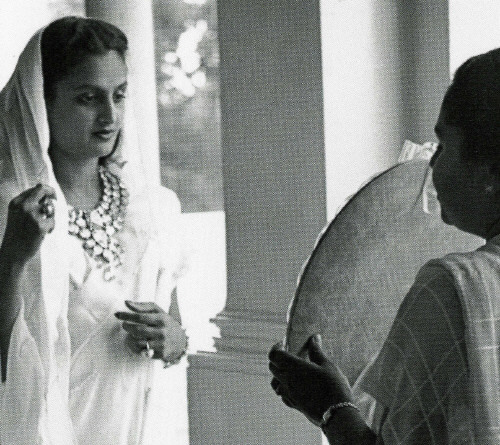 Later, for reasons not divulged, it was sold to Mulhar Rao, the Gaekwar of Baroda, for £80,000, or about $400,000. 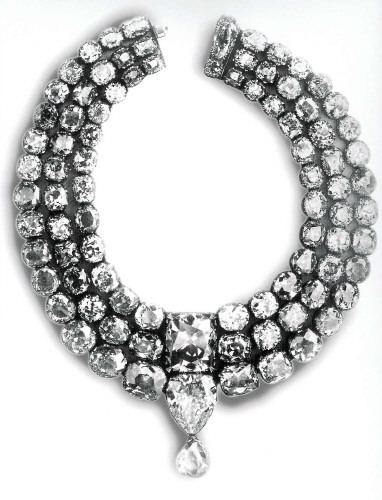 modified version of the necklace where more diamonds had been added around the bottom portion of the English Dresden. The Gaekwar gave the commission for this transaction to E.H. Dresden, who made the original purchase of the well-known English Dresden Diamond. In 1934, the potentate's son told Robert M. Shipley, the American gemologist, that both the Star of the South and the English Dresden were mounted in a necklace amoung his family's jewels. Star of the South and the 78.5-carat English Dresden below it. Photo circa 1880. 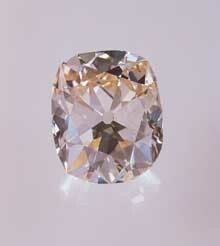 Sometime around 1999, GIA was allowed to examine, grade and photograph the large diamond. Cartier bought the stone from Rustomjee Jamsetjee of Bombay, India around 2002. Special thanks to James Butcher for sending me the article that contained this photo of the Star of the South! Up til then, I had never seen a photograph of the actual diamond, just Tom R. Barbour's quartz replica in a xerox of an old Lapidary Journal, and a photo of a glass copy of the stone in GIA's book "Diamonds - Famous, Notable and Unique."